Massage Therapy saved my music career! Back in the Fall of 1999, while in the middle of promoting my very first release, I was diagnosed with carpal and cubital nerve irritation in both my left and right arms. Playing the piano, something that I had done since the 2nd grade, was now a virtual impossibility. I was gripped with shooting pains up and down both of my arms and through both of my wrists whenever I tried to play the piano. I was counseled by my physician - as well as numerous other professional musicians - that it was time to think about not only other employment, but the fact that I may never play piano again. I was devastated, but luckily a friend of mine was getting ready to finish up at the Chicago School of Massage Therapy (it has since been bought out by, and amalgamated into, The Cortiva Institute). My friend reassured me that my physician and the numerous other professional musicians that had informed me that my nascent career as a professional musician was over were, in fact, mistaken. My friend believed that through a series of therapies involving heat, ice, and regular massage, I would be able to resume my career just as it was getting ready to begin. She was right: after taking a year off from playing, moving back to Rome, Italy to work and heal, slowly but surely building my time playing from 5 minutes a day to ultimately 2 hours a day, and using heat to warm up before playing and ice to cool down after playing, I was able to grow and build a professional career that has now endured for 10 years. Everyday I wake up and I am thankful for the healing provided to me by my friend and every other subsequent LMT that I have had the honor to work with. The healing work provided by massage therapy is real, clinical, and measurable. If you're a massage therapist, please take a moment to check out the site, if you're not a massage therapist, and you're thinking about utilizing massage therapy as a mode of clinical healing (or just relaxation/spirit centering) take it from me, massage therapy works. Book your session. There are direct physical benefits to massage therapy. Thank you for sharing your healing story on my website, Michael. 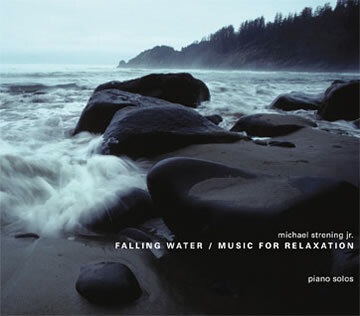 To my site visitors: I use Michael’s lovely, gently rhythmic solo piano music on Falling Water in my massage practice to ground and pace my sessions - just as the steady cadence and fullness of lapping waves grounds and paces us as we walk along a beach. Michael’s music slows time and expands the world. By the way,you can listen to Michael's music on his website - check it out!